Benjamin Franklin was a Founding Father of the United States, renowned for numerous accomplishments, including being a member of the Committee of Five that drafted the Declaration of Independence and later signing that same document on July 4, 1776. In Mario's Time Machine, the Declaration is stolen by a time-travelling Bowser in 1776, and Mario later brings back to Philadelphia in an attempt to return it, leading to Mario and Benjamin encountering each other. Mario also travels in time to 1752 return a Key that Benjamin needs for his kite experiment, which was also stolen by Bowser. According to Mario's Time Machine, Benjamin Franklin lived in Philadelphia in 1752 alongside his wife, Deborah Read, and his two children, Sarah and William. 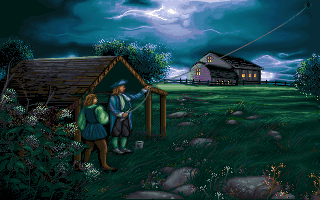 Benjamin, with the help of William, is attempting to fly a kite during a thunderstorm so that it can be shocked, as he was trying to figure out the nature of lightning and electricity. However, though there should be a Key attached to the kite's string, it is stolen by Bowser, preventing Benjamin from completing the experiment. Mario travels back in time to return the stolen Key to him without first knowing that it belongs to him. If Mario attempts to talk to him regardless, he visits him in his backyard and asks him why he is outside in a storm, and he replies that he needs to take advantage of the thunderstorm before returning his attention to his kite. Mario must question the other people within Philadelphia, including Deborah Read, about Benjamin and the Key, and everyone he talks to freely describes his political views, his history, and his scientific and enterprising innovations, which allows Mario to confirm that the Key belongs to Benjamin. He then brings it to him while asking him if he needs it, and Benjamin gratefully thanks Mario for helping him complete his experiment. He immediately attaches the Key to the kite and lets it fly. Mario says that Benjamin has inspired him to invent something someday, and Benjamin tells him not to put it off for another day before using one of his quotes: "The used key is always bright!" Later, in 1776, Benjamin Franklin still lived in Philadelphia, working at the publishing house of his Newspaper, the Pennsylvania Gazette. He is visited by Mario while he is printing the newspaper's newest issue, which covers today's signing of the Declaration of Independence. As Mario is in possession of the Declaration but does not know his importance, he asks him what is going on. Benjamin, surprised by his lack of knowledge, tells Mario that America is attempting to secede from Great Britain, and that he needs to hurry to Independence Hall. The two then introduce themselves to each other, with Benjamin proclaiming that he is a publisher, a scientist, and an "occasional inventor," while also giving Mario a copy of his newspaper. Mario then recognizes him as a Founding Father, although Franklin doesn't recognize the term, instead referring to himself as the Pennsylvanian representative to the Continental Congress. He then realizes that he lost his glasses (while also boasting that he "invented bifocals"); his Spectacles can be obtained from a worker at a nearby stable, and when returned, he thanks Mario. He then explains that he never signs anything before reading it, even when written by someone like Thomas Jefferson (referencing how Jefferson wrote the document's first draft, although the final rendition featured numerous changes from the other members of the Committee, Franklin included). Mario then asks Franklin if Jefferson also wrote America's Constitution, to which he replies that America does not have a constitution yet but that the Constitution and the Declaration may be confused with each other in the future. He then elaborates more on Jefferson's backstory, leading to Mario to show Franklin the Declaration in his possession. Franklin immediately begs Mario to bring it to Independence Hall immediately so that it can be signed.